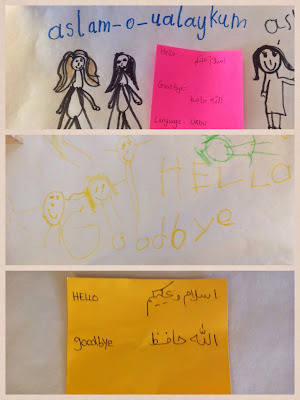 this kindergarten life: how do you say hello? This is the story of a project born out of a spark, as are so many in our class. The spark was not something entirely new in our routine, but instead something we took the time to notice. I always greet my students upon entry to school, and let them know whether or not we'll be starting our day outside ("Please hang your backpacks, we're heading out!") or inside. I chat with students as I take attendance, asking about their treasures (because someone has always brought something special to show us) or simply saying hello. Most days my students greet me with a cheerful: "assalamu alaikum" or "Marhaba". One day at our welcome circle on the carpet, a girl "C" greeted her class in her home language, Vietnamese, by saying: "Chao". I said I was happy to learn a new way to say hello! We all practiced it "chao" and then she told us it also means goodbye. Well that news was surprising to many of us. I told the students that it reminded me of Italian, in which you also greet people by saying "ciao". Suddenly everyone had their hand up or was excitedly shouting out another way to greet friends. It reminded me of the day our "We Can Count!" project began, just over a year ago. As we often do when something exciting happens in our class, we tweet our families and followers to share the news. Here is the story of our "Hello, Goodbye" book, in the tweets we sent. #PM friends were excited when @RobDiPro visited & said: "Hi" & "Bye" in Italian: "Ciao". C said: "that's how we say it in Vietnamese, too!" @FynesKs count me in. Very excited to be a part of it. Z wants to remind you @RobDiPro "come to our class and then you can say hello and goodbye"
2/2 to get the details for her picture. C noticed @RobDiPro's glasses & flower. In Italian Mr. D's "Ciao" sounds like C's Vietnamese "Chao"! Our project was made even more meaningful with the active participation of our principal at Thornwood PS, Roberto Di Prospero. My PM class were excited by his interest in their project, and while we understood his job is to take care of the whole school, students reminded me every day (including Z's tweet to @RobdiPro above) that they wanted him to add his Italian greetings to our book. Here is the book we have created so far. Many more students have brought in their "hellos" than were added into our digital book. (Some students were happy to share in class but aren't comfortable with recording their voice to share). Other inquiries are ongoing in class, with much focus this spring on finding "all kinds of lines", our #kndspring collaboration with "Ranger" Rob Ridley, and our newest living subjects at our #lookclosely centre (which the students have so far decided might be worms, centipedes, baby snakes, or caterpillars). It's my hope that all the students who wish to will add a page to our book before the end of the year. Note: if you are viewing on a mobile device it's likely that you see an empty space above where the Voicethread book is embedded. If so, click here to view the book on the free app). One of the benefits of an inquiry into the many languages in our community is the celebration of all the diverse types of writing systems in our world. We look closely at the different ways people write around the world: right-to-left orientation, script that scrolls down the page, letters, syllables and entire words in a symbol. This project has opened our eyes to the wonder of languages as they are spoken and written around the world, and more specifically, in our homes. The following quote from the introduction to the Kindergarten program outlines the importance of honouring the languages and cultures of every student. Our inquiry may have started simply with a greeting, but it grew into so much more. Principle 2: Partnerships with families and communities strengthen the ability of early childhood settings to meet the needs of young children. It is essential for the Early Learning–Kindergarten team to work with members of the local school community in order to develop familiarity with the community’s unique characteristics, strengths, and needs, and the opportunities it affords for learning. At the start of the school year, teachers and families may collaborate with other significant education partners, such as early childhood educators and school and community resource teams, to ensure that the child experiences as smooth a transition to the school environment as possible. Throughout the year, a welcoming and inclusive approach by the Early Learning–Kindergarten team and other members of the school staff can empower community members to become ongoing partners in the child’s education. In a multilingual community, it is helpful to arrange for interpreters to be available so that important information can be exchanged and good relationships established. Projects and activities in early childhood settings can involve learning about community life. Taking field trips to interesting places in the community, inviting community experts to the classroom, and having community members bring in artefacts from the community related to topics of immediate interest to the children are examples of activities that promote learning and bring the local environment into the daily activities of young children. Children benefit from respectful interactions with a variety of community members, and from a sense of connection and engagement with their environment. My friend and often-collaborator Helen Chapman also created a beautiful multilingual book with her AM & PM classes at her school. As our classes often share ideas, and our students sometimes offer comments and questions on the other's tweets, it is an honour to share her story along with ours at the "2014 Celebrating Linguistic Diversity Conference" at OISE on Friday, May 2nd. To read her story and view the class book, please visit her blog post here.. If you are a family member of one of my wonderful students, I would love to hear what you think about our story. If you are an educator following our story, either through the blog or because you heard about the project at the "Celebrating Linguistic Diversity Conference", I welcome your questions and/or feedback. If your class has more languages to share, we would love to hear how you say hello (and goodbye)! Please tweet us or leave a comment how we might learn how to say it how you say it! I enjoyed reading about your "hello and goodbye" project. Have you heard the Hap Palmer song "Round the World with Ways to Say Hello"? I bet your students would enjoy it. Thank you for sharing - I don't know that one, we'll have to search for it! We were very fortunate at our school to have the wonderful Jack Grunsky come to perform this week, and my students loved his "Walk Around the World" with hello's in many languages, too. I will find your song and maybe we'll learn it next week.